Good question. 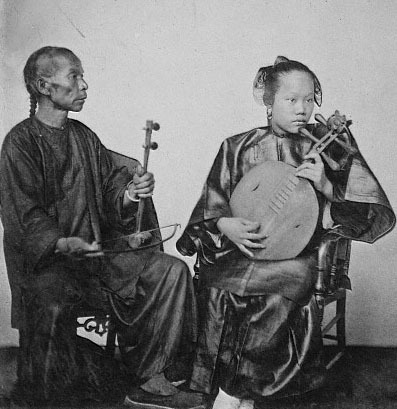 the duo shows the round “Yueqin” and what I think is a “jinghu” or possibly a “Gaohu”, but the latter was developed until the 1920’s. Both are higher pitched versions of the Erhu. 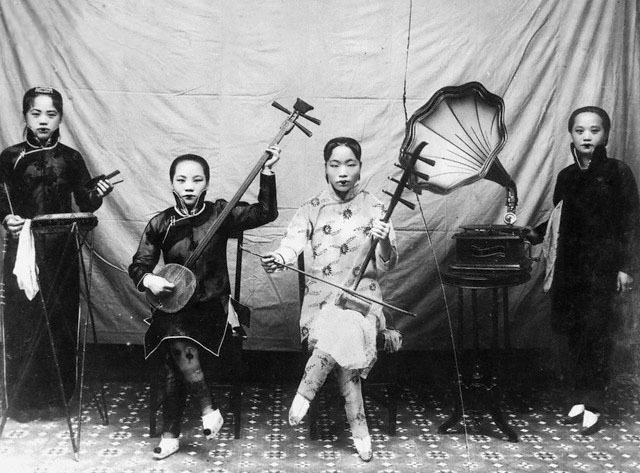 The middle picture shows a small opera ensemble with Erhu, Sanxian and percussion. Why is there a victrola? Why the strange lipstick? I do not know. Perhaps they were recording artists. 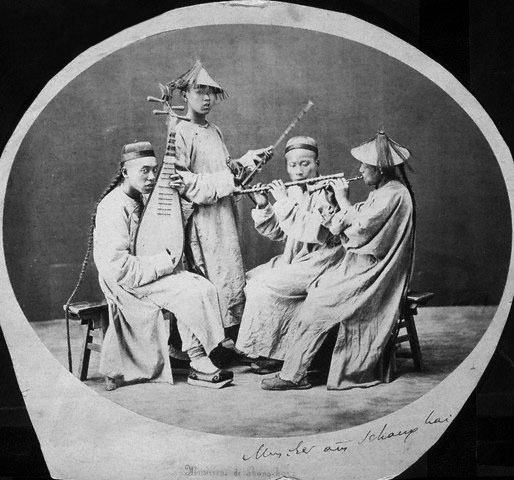 It’s important to remember that “ethnographic” portraits were very common in those days and it’s possible the subjects of the photo were not even musicians. The 3rd photo shows what I believe is a wedding ensemble with Pipa, 2 flutes, and Suona. It’s also possible that this was an opera or folk ensemble. As to what type of music they might have played, you can bet it sounded similar to many of the examples here on Haji Maji, especially the middle pic with the Victrola. what kind of ensemble is pictured here? what type of music might they have played specifically with this sort instrumentation and what might the deal be with the gramophone? OMG, ook closely at the second picture, the ladies have bound feet.